Outdoor lighting has come a long way in the last decade. An industry that once relied on halogen lights has switched to nearly universal acceptance of LED outdoor lighting. The benefits are mounting, mostly in efficiency and lifespan. At the same time, upfront costs are dropping quickly, making LED a no-brainer for most outdoor lighting. Our Atlanta outdoor lighting contractors at Night Vision highly recommend to homeowners change their outdoor lighting systems to energy-efficient LED lights. If you have an existing system, Night Vision can help you transition to LED. If you are installing a new system, Night Vision now uses LED lights exclusively for all of their outdoor installations. 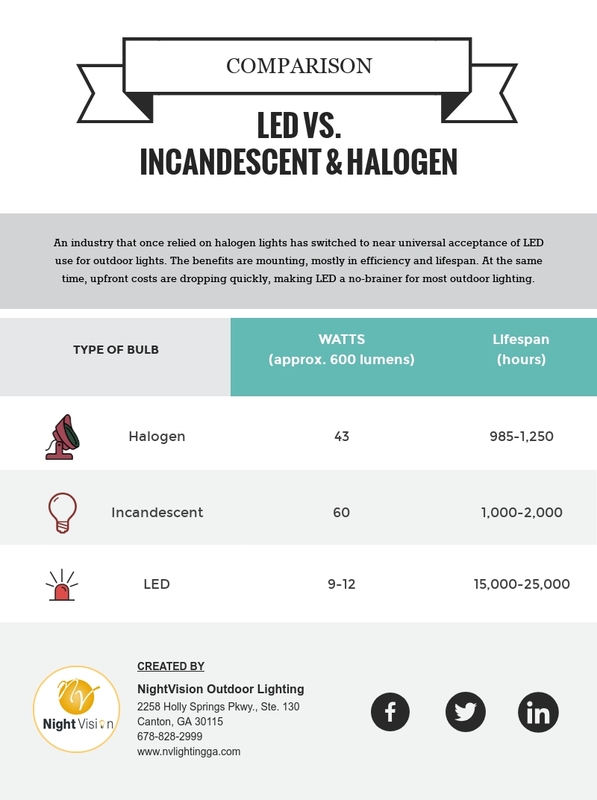 When LED lights are compared to traditional bulbs—i.e. incandescents and halogen lights—LED lights last much, much longer! They also use much less electricity. It’s apparent that if you want to save money, an investment into LED lights goes a long way. Night Vision offers LED outdoor lighting at a great price. Because we order in bulk, we get prices the average consumer can’t. And we pass those savings on to our customers. First, we create an outdoor lighting design that highlights your home and landscape. Then our skilled technicians install the entire system to the most exacting standards. We provide all the lights you need as part of our installation. Night Vision creates great designs but always with attention to the details. And the secret to great lighting is always in the details. Incandescents, halogens, and other types of lights on the market cannot compare in quality and savings to LEDs. That is why switching to LED lights for outdoor lighting is the smartest choice for the long term. Contact Night Vision Outdoor Lighting for a custom lighting design quote today. NightVision Outdoor Lighting is a landscape lighting company based in Canton, GA. With over a decade of experience, NightVision Outdoor Lighting provides metro Atlanta and North Georgia with the highest quality landscape lighting products and service. To learn more about NightVision Outdoor Lighting, contact us.